The mystical Qilin 麒麟 was a celestial animal representing the west quadrant in Chinese mythology. Later, it appeared on rare occasions –particularly at the time of a solar eclipse-- in order to announce the birth or death of a sage or emperor. In China, it was second only to the dragon in its power. “The Qilin was believed to have sprung from the centre of the earth and was the first and most perfect of the 360 land creatures”. (1) This mystical animal gave gift of the art of writing from the time of Fu Hsi to the time of Kongzi. It was closely associated with Kongzi 孔子 since it manifested itself to his mother who carried him in her womb and to the sage himself. On the animal’s coat, Fu Hsi saw markings. The emperor perceived those symbols as a written language. (4) According to legend, this was the origin of Chinese calligraphy. Tradition though mainly credits Fu Hsi with the discovery of the trigrams and invention of knotted cord records which led to written script. Mythology also attributes the invention of the Qin (lyre) to Fu Hsi who wished to harmonize mind-heart with the universe. By the late Zhou period it played an important role in ritual music. Its seven strings were tuned to the five pitches of the natural pentatonic scale. The Yellow Divine Ancestor was credited with the invention of the calendar in the 61st year of his reign. The first historical record of the 60 day cycle began on March 8, 2637 BCE. This year was designated as year one of the Chinese calendar. The calendar was based on precise astronomical observations of the longitude of the sun and phases of the moon. Kongzi himself recorded thirty-seven eclipses of the sun between 720 and 481 in the Chun Qiu 春秋. The eclipses of 709, 601 and 549 were total. Of course, he primarily recorded eclipses as seen from his own vassal state of Lu in Shandong Province (lat. 35” 40’N, 117 E). There were several conjunctions of major planets “wandering stars” in the years 552 and 551 BCE according to Dr. John Harper at Wychwood Observatory. In March 552, there was a conjunction of Mars and Jupiter. In February of 551, Jupiter was in conjunction with Venus rather near to the sun. Finally, in June 551, there was a conjunction between Mars and Jupiter west of the sun and visible in the morning sky. (9) Conjunctions involving the planet Jupiter may have been important to the ancestors of the Zhou and possibly to the Xia and Shang before them. (10) Of course, the moon would align on a monthly basis with each planet throughout this period of time. It is appropriate here to consult a modern Confucian philosopher regarding the definition of virtue 德. A question was posed to Sun Dawu 孙大午 who is Head Master of the Dawu High School in Xushui County, Hebei. “Master Sun, what is virtue?” “Virtue is the headspring of eudaemonia and pleasure because the person is social and virtue is a social norm”. Ursa Major or the Great Bear 小熊座 is a circumpolar group of stars. One part of the configuration or seven stars is pictured as the tail of the Great Bear. The two stars known by the Chinese names of Twinkling Brilliance 搖光 and Assistant 輔 point to Polaris “Tsze-wei” or the North Star. This is the location of the Emperor’s Seat 帝座 . Kongzi also edited an official collection of poetry of the Zhou Dynasty that constitute the Shih Ching 詩經 (Book of Odes). Some of the 311 poems had astronomical themes or references. One poem begins with the following lines: “The Milky Way in Heaven shines on all brightly. The Weaving-Lady labors there, beside the River …”. There are four spiritual creatures known as Si Ling 四霛/四灵 in Chinese mythology. In the mist of pre-history, they are found in the four quadrants that represent directions and seasons. The four celestial animals are the Qing-long, Feng-huang, Ch’i-lin and Gui-xian. The Qing-long 青龍 or dragon (east) is a bringer of good fortune and symbol of the emperor’s power. The Feng-huang 鳳凰 or phoenix (south) is a propitious sign.. The Ch’i-lin 麒麟 (west) represents benevolence and harmony. The Gui-xian 玄武 or tortoise (north) symbolizes longevity and happiness. It appears that the perception of the Qilin underwent a change over time, but it is difficult to trace the exact development. Originally, there may have been only three celestial emblems. The earliest bronze mirrors show the Qinglong, Feng-huang and Ch’i-lin on the reverse side. (20). The Qilin then may have joined a group of four that included the Qinglong 青龍,Feng-huang 鳳凰 and the Gui-xian 玄武. Finally, the Qilin may have spiritually harmonized the five elements represented by Qing-long 青龍 yellow dragon, Zhuque 朱雀 red sparrow, cauldron 鼎, Baihu 白虎 white tiger and Black tortoise 玄武 (some later mystical texts refer to the Xuan Wu 玄武 or Black Warrior). In astronomical terms, the colours are associated with the five planets. They are Jupiter “Soui-sing”, Mars “Ying-houo”, Saturn T'ien-sing” or Genie of the Pivot “Tchou-niou-tchi-chin”, Venus “Ying-sing” and Mercury “Chin-sing”. In the heavens, the colours also correspond to the heavenly dragon (east), phoenix (south), cauldron (centre), tiger (west) and tortoise (north). There are also five different types of Qilin. Each has a correspondingly different color. Indeed, the Qilin is a combination of five animals. It has the face of a dragon, the body of a deer, the mane of a lion, the tail of an ox and the hooves of a horse. In a sense, the Qilin symbolizes the harmonization of these disparate elements, colors and parts. The spiral horn of the Qilin faces backwards. This indicates its peaceful intentions. Its horn may be a kind of fertility symbol because it represents the wish for a son. It is the male Qilin that has a horn. Its horn may also symbolize an eclipse of the sun because the horn is the same shape as the crescent of the sun. The gender of the Qilin is both male and female as indicated by the Chinese name 麒麟 which is a combination of the two characters chi (male) and lin (female). The Qilin appears on special occasions to announce the imminent birth of a sage or ruler. It is believed that Confucius’ mother saw a Qilin. This was prior to the birth of her son. It presented a jade tablet to Ching-tsae that proclaimed all the great things that her son would accomplish. Furthermore, it declared that he would be a King without a throne. One may easily dismiss the story about his mother's long gestation period as mere hyperbole. It was said that it lasted twice the normal time. However, a simple explanation may suffice to account for this belief. Today, this rare rhinoceros is an endangered species. There may be only 2400 in existence. Its habitat may extend to southern China. Unscrupulous poachers shoot to kill this beautiful animal for its horn which is used in Traditional Chinese Medicine. The long human gestation period of Kongzi is not unique among the ancient Chinese. It is said not only that Lao Tze's gestation period was 81 years, but that he gave birth to himself and was born an old man. Does the number 81 suggest that he was 81 when he died and/or that it took 81 years to write his philosophy and/or that the length of the Tao Te Ching is 81 verses? The facial appearance of Kongzi is singular. His face was homely; although a pleasant smile diverted attention from his looks. There were several warts on his cheeks. Furthermore, there was a large bump on his forehead. In a metaphorical sense, his looks may suggest that of a Qilin. As a magical master of naming, he also correctly identified the source of the giant bone of a dinosaur. The bone was uncovered by a landslide at Kuaiji. (24) Was the account of the naming of the Qilin inspired in part by the earlier discovery of this giant dinosaur bone and its identification? After Kongzi had sighted the dead Qilin, he completed his compilation of the Spring and Autumn Annals of the Zhou Dynasty or Chun Qiu 春秋. However, it may be that he wrote a final poem on the theme of the Qilin. and the Phoenix walked abroad. And what do they seek? In order for the sign to complete a full circle, it would require 72 years times 360 (degrees) equals 25,920 years. This number represents the period of the luni-solar precession or what is known as the Great Year. Plato believed that the perfect harmonius number was 25,920. Music was one of the arts that Kongzi mastered. He played the seven string lyre called the ch'in while he compiled the Book of Odes. Also, his sixth classic was called The Classic of Music or 乐经­ Yue Jing. It was Kongzi's view that wholesome music was conducive to harmony within the individual and order within the state. In the Li Ji 礼记 (Book of Rites), Kongzi expounded that each of the five notes of the pentatonic scale or C, D, E, G and A stood for a cosmic element. The five notes are Gong (Kong, Kung), Shang, Jiao, Zhi and Yu. They represent respectively the ruler, ministers, people, world affairs and 10,000 things. Harmony will prevail in the land if the notes are clear. According to Kongzi, the physical structure of the Qin related to the cosmos to which it resonated. The top surface was rounded like the heavens. The underside was flat like the earth. The space was the emptiness of the Dao. The seven strings represented societal strata. A bamboo rod tuned to the Kung was used by Ling Lun (who was a minister of Huangdi) to discover twelve tones that were made by taking two-thirds of each successive tone. In their 2:3 proportions as "fifths" the seven notes appear as F, C, G, D, A, E and B. (33) The twelve tones could be subdivided into 12 lesser Tones associated with the twelve Zodiacal regions. According to Hightower, the introduction of the factor of five brings us to the harmonic modal scale. (34) He lists the intervals as the harmonic major sixth (5/3),the harmonic major third (5/4), the minor third (6/5), the major half tone (16/15), the minor half (25/24) and the syntonic comma. In this music expert's opinion, the number 5 harmonizes the music while the number 7 may transport it to heavenly regions. Is it any wonder that at Kongzi's birth music floated from heaven and five immortals descended sedately from the clouds? It seems that Kongzi knew that his death was imminent. It is interesting to note that there were two eclipses recorded prior to his birth in the year 552 BCE and another eclipse in the year 481 (two years prior to his death at the age of 72). In both years, a Qilin was sighted. It was probably the same Qilin since they live for a thousand years. Or was it that his mother saw a male Qilin (sun) and Kongzi saw a dead female Qilin (moon) and metaphorically himself as the last sage? 1. "Unicorn Legends: The Chinese Unicorn"
Source: The Chinese Classics, Part III, The Annals of the Bamboo Books, p.108. 12. John Williams, Observations of Comets from B.C. 611 to AD 1640, Digital Library of India, extracted from the Chinese Annals, introduction ix, London: 1871. 15. Harmen Mesker, "The Shen Sacrifice at Qi Shan"
18. Starry Skies, "Constellation Lyre"
19. Roel Sterckx, Animal Classification in Ancient China, EASTM23 (2005): 26-53, Di Xing, Huainanzi, translated in Major (1993), pp. 208-209. 20. Derek Walters, Chinese Mythology: An Encyclopedia of Myth and Legend. 25. "Unicorn Legends: The Chinese Unicorn"
29. Chapteer 2, Three Streams, Two Approaches to Musuc. ** Aquila Constellation: Chinese text around 500 B.C. identifies pattern of Aquila with the draught ox. In Chinese myth, the herdsman Ch'ien Niu (the star Altair) is separated from his lover Chih Nu (the star Vega) by the Sun King or T'ien-tsin for their neglect of their duties. They are separated by the river (Milky Way). The princess is sorrowful and asks help of the birds (Aquila and Cygnus "swan"). In Chinese tradition, the magpies form a bridge with their wings over the river. It is also said that the magpies may have built the bridge out of small twigs they carried. The lovers are able to meet once a year on the seventh day of the seventh month. A third star or Deneb represents the "tai bai" fairy or the chaperone of the two lovers. The cowherd carries their two sons (the two stars on either side of Altair or Alshain and Tarazed) to reunite with their mother. "Brilliant show the Draught Oxen, but they do not serve to draw our carts". The three bright stars were their Cowherd from whom the Magpie's Bridge gives access to the Spinning Damsel (Lyra) across the River of the Sky; the Milky Way. [SLM p.58]. Click, click goes the shuttle of her loom. The Pleiades marked the beginning of the rainy season. They could be found in the heart of the Chinese Dragon constellation. "On the Frontier" by Li He. In the still of autumn see the Pleiades. Far out on the sands, danger in the furze. Where the sound of the river streams beyond the border. The mao2 tou2 refers to yak-tail, and also to a kind of ancient flag, decorated with yak tail at the top. However, mao2 tou2 (mao head) actually referred to the Pleiades. The modern Chinese name is mao3. As Graham points out, the flickering of the Pleiades was an omen of invasion by the northern barbarians. He was born on the 20th day after the eclipse of the sun which took place in the 10th month of 552 B.C., or the 27th of the 8th moon as worked out to-day. 8th month Osmanthumens (osmanthus month) 宩寧: osmanthus blossoms. Ancient China Simplified, Edward Harper Parker, Chapter V, Evidence of Eclipses. Confucius' birthday Confucius himself records thirty-seven eclipses of the sun between 720 and 481, those of 709, 601, and 549 being total. Of course, Confucius primarily recorded the eclipses as seen from his own vassal state of Lu in Shan Tung province (lat. 35” 40’ N., long, 117” E.). The first (southernmost) gate is named "Lingxing Gate" after a star in the Great Bear constellation, the name suggests that Confucius is a star from heaven. 7. "In about 12,000 years, the brightest star of the Constellation Lyre will become the North Star. A slight wobble in Earth's daily rotation causes our north pole to trace a circle among the stars every 26,000 years. This motion is called precession and it causes the pole to point at different stars over this 26,000 year period." throne is in Tsze-wei,that is, the Polar Star. Immediately over the central peak of Kwen-lun appears the Polar star, which is Shang-te's heavenly abode. In the central place the Polar star of Heaven, the one Bright One, the Great Monad, always dwells. The parallelogram shaped Lyre may be seen in the map of the early autumn skies where it is positioned at a higher latitude, but between a line running through the Constellation Hercules and Aquila. 11. In 352 B.C. 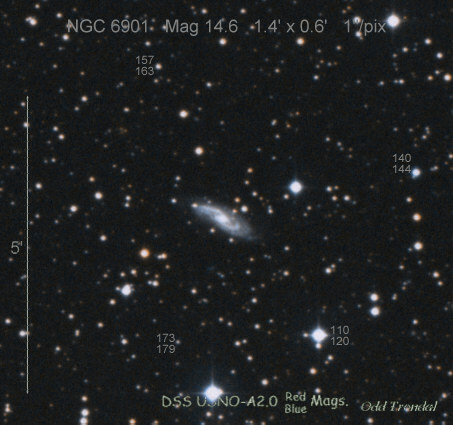 Chinese observers report a supernova--the earliest recorded sighting. This sighting may have inspired Shih Shen to create his star map. Refer to the The Chinese write the Book of Silk, which is the earliest known atlas of comets. The book is discovered in a tomb in 1973. The Chinese called Sirius by the name of 天狼星 (tiān láng xīng; tenrōsei) or literally the heavenly wolf star. They knew this place as the bridge between heaven and hell, the bridge of the gatherer, the judge. In the higher mind are gathered the results of the experiences of the personality. Between each life, the soul judges its past progress and the conditions needed to aid its future growth. As long as it is attached to desire, sensation, and needs experiences, it takes a body. The soul cannot pass over the "bridge" until it is perfected. 天狼星 is the brightest star in the Northern Hemisphere. It appears as a white star about 10 times brighter than our sun. It was described by Sima Qian in the Shih Chi-day Official Book written around 100 B.C. as "White than wolf". In the Soochow Astronomical Chart, an eight-centuries-old inscription in stone, in a section that deals with past irregularities in the heavens, there is the following statement: “Once T’ai-P’ai (Venus) suddenly ran into Lang Hsing (Wolf Star, Sirius), though it is more than 40 degrees south of the Yellow Road.”6 The Yellow Road is the ecliptic.7 The same ancient tradition was referred to by the early eighth-century A.D. Chinese astronomer Y-hang. As told by Gaubil,8 Y-hang wrote that “in the time of Tsin one saw the star Sirius eclipsed by the planet Venus. Y-hang, after having reported this alleged observation, assures that Sirius has 40 degrees south latitude, and that therefore Heaven changed the course of this planet in the time of Tsin. As the Chinese astronomer correctly observed, the ancient records of Venus' movements cited by him would require the planet to travel outside of the ecliptic, on an orbit quite different from its present course. Whereas the Soochow Astronomical Chart might leave the impression of a one-time event, the more detailed records cited by Y-hang tell of a regular phenomenon. The brightest of the planets approaching the brightest of the fixed stars and merging its light with the heavenly wolf star, if that is the correct interpretation of the texts, must have been an impressive sight. The ancient Chinese regarded the planet Venus as a male warrior, so Venus' occultation of Sirius would herald a time of strife. Venus is ten times brighter than any star and Sirius is the brightest star in the Northern Hemisphere. They must have been quite a brilliant pair as Venus approached Sirius. A main-sequence star with this mass would have emitted a few times more light than Regulus in Leo, which a 2005 study found has 3.4 solar masses. If Sirius B shone so brightly today, it would look brighter than Venus or bright enough to cast shadows. Sirius B shone as a main-sequence star and then a red giant for 101 to 126 million years or the expected lifetime of a star born with about 5 solar masses. Every 49.9 years, Sirius A and B, come as close together as their orbits allow, creating huge magnetic storms between them. As they approach each other, the stars both begin to spin faster as tidal forces become stronger, finally flip-flopping over, actually trading places with each other. To the ancient Chinese, solar eclipses meant that dragons were devouring the sun. Observing total solar eclipses was a major element of forecasting the future health and successes of the Emperor, and astrologers were left with the onerous task of trying to anticipate when these events might occur. Failure to get the prediction right since the pattern of total solar eclipses is erratic in any specific geographic location resulted in the beheading in 2300 B.C of two astrologers. Other cultures have not been so optimistic. The Chinese, known for their meticulous observations, have left such fabulous relics as the Mawangdui silk, a textbook of 29 different cometary forms and the various disasters associated with them. "Already on oracle bones is dou 斗 used to refer to the star constellation beidou 北斗, the Northern Ladle, in the West known as Ursa Major or the Great Bear. The 甲骨文字典 explains dou as "疑用為星名,即北斗,夕至翌日祭之. ", "probably the name of a star (constellation), namely beidou, from the evening to the next day sacrifices are made to it". There are other heavenly bodies which likewise exercise an influence upon the earth. As the five planets form, in addition to the sun and moon, the seven rulers of the seasons, thus also the seven stars of the Great Bear contribute their quota to the direction of the seasons. This splendid constellation has attracted the attention and poetical fancy of almost every nation on earth; but I never heard of any people that turned this remarkable cluster of stars to such a practical account. The Chinese look upon the seven stars of the Great Bear as forming a natural clock. For the body of the Great Bear being in ancient times considerably nearer to the North Pole than it is now, the tail appeared to move round the pole somewhat like the hand of a clock or watch. Considering then the earth's surface to form the dial-plate and dividing the horizon into twenty-four equal parts, whilst the tail of the Great Bear acts as the hand of the clock, we have a simple method to determine the above mentioned twenty-four seasons of the year. When the tail of the Great Bear points, at nightfall, to the East, it is spring to all the world. When it points to the South, it is summer; when it points to the West, it is autumn; and when it points, at nightfall, to the North, it is winter. The light of these seven stars is supposed moreover to exercise a great influence upon the earth and upon all dwellers on earth, and these seven stars are, therefore, combined with sun and moon, called the nine luminaries of the world. The Great Bear Constellation also represented the government in ancient Chinese culture. List of Chinese Constellations and their Western Equivalents. 名称 角. 亢. 氐. 房. 心. 尾. 箕. 斗. 牛. 女. 虚. 危. 室. 壁. 星期 木. 金. 土. 日. 月. 火. 水. 木. 金. 土. 日. 月. 火. 水. 编号 1. 2. 3. 4. 5. 6. 7. 8. 9. 10. 11. 12. 13. 14. 名称 奎. 娄. 胃. 昴. 毕. 觜. 参. 井. 鬼. 柳. 星. 张. 翼. 轸. 编号 15. 16. 17. 18. 19. 20. 21. 22. 23. 24. 25. 26. 27. 28. As far as cataloguing went, Shi Shen, Gan De, and Wu Xian (370-270 B.C. in sum) recorded 1464 stars in 283 constellations. This is 200 years before the first western catalogue (by Hipparchus). In A.D. 310, Astronomer Royal Qian Luozhi had a bronze celestial globe made with stars that were color-coded as to their source. From the Han Dynasty, there are carvings that show constellations and asterisms with stars linked to delineate the various groups. The Chinese constellations were in the form of Five Palaces; the number five possibly results from the five elements of earth, fire, water, metal, and wood. The Palace of Purple Tenuity was the circumpolar area. The Palace of the East was the Azure Dragon. The Palace of the South was the Vermillion Bird. The Palace of the West was the White Tiger. The Palace of the North was the Dark Warrior, represented by an intertwined turtle and snake. 1680? 1667? Cas Cas A Flamsteed ? not seen ? Tang Dynasty 618 - 906 A.D. This section of the scroll depicts an anthropomorphic figure holding a bow, labelled 'God of Lighning' in Chinese. Each of these enclosures contains a number of asterisms and some named stars. Then there are twenty-eight mansions that contain a number of asterisms and a few named stars. Complete Listing of Enclosures, Mansions, Asterisms and Stars are found at the link below. English-Chinese Glossary of Chinese Star Regions, Asterism and Star Names. While the rectangle is not a natural shape on the earth nevertheless it is perceived to be found in the heavens. For example, it is found as the North Circumpolar Rectangle (NCP). On one end it is composed of the stars Alcor-Mizar and Alioth of Ursae Majoris (Big Dipper) and on the other end Pherkad and Kocab of Ursae Minoris (Little Dipper). The dipper asterisms revolved once a year about the polestars 11 Draconis and 10 Draconis—its binary companion. In the early Egyptian lunar calendar this revolution took 360 days. The author contends that in the same way it may have been seen that 10 Draconis orbited seven times in 359.8 days around 11 Draconis. To be more specific, they orbited each other in a gravitational embrace. Both polestars were visible to the naked eye. It was reported that in the past 11 Draconis (the Alpha star of the constellation of Draco) was actually brighter than it is today. Currently, its apparent magnitude is 3.65 while the magnitude of 10 Draconis is 4.62. The polestar today is called Polaris which is brighter than both although it will never be as close to the northern pole. Mirovlav Verner who was author of The Pyramids used a simulated reconstruction of the sky over Giza in 2,500 BCE. He shows that the north shaft in the King's Chamber was aimed at Alpha Draconis (Thuban) ... while in the Queen's Chamber the north shaft was aimed at Beta Ursae Minoris (Kochab). It is conceivable that these shafts directed the souls of the pharaoh and his queen on their solar boats to the afterlife. In 2787 BCE, 11 Draconis (Thuban) lay just 1/180 of the width of the full moon from the northern pole. Both 11 and 10 Draconis remained pole stars from around 4000 to 1900 BCE. These pole stars were also known respectively by the Chinese as Taiyi and Tianyi which according to Didier "are none other than those that sat at the pole during the 3rd millennium B.C." (Didier, "In and Outside the Square", p.82. Taiyi was called Taiyi (太一) or the Great One and Tianyi (天一) or The Heavenly One. It is likely that Tianyi was another name for Taiyi when the god toured. The three sides of the The Great Pyrmid are as follows: 1) Pherkad to 11 Draconis to Alcor -Mizar 2) Alcor-Mizar to Merak 3) Merak to Pherkad. The three sides of the Khafre pyramid are as follows: 1) the 10 Draconis line 2) down to Merak 3) towards the baseline of the nested rectangle of the NCP and pointing to Pherkad. This means that the Khufu pyramid (triangle) is the largest of the nested triangles. The royal falcon which represents the pharaoh is a nesting bird. From the Sacred Celestial Falcons (D. Carlton Rossi copyright 2014) one can see a falcon on the left which might be superimposed upon the nested triangles. The feature of nesting indicates close family ties between father,son and grandson. The pyramid of Menkaure (grandson)is a nested pyramid (triangle) of both Khafre and Khufu. It runs as follows: 1) one side from Megrez to the base of Khafre and Khufu 2) the other side from Megrez to Merak while the base runs toward Pherkad. It means effectively that one side of Khufu and Khafre are pointing toward the cup of the Little Dipper while another side of Khufu, Khafre and Menkaura are pointing to the cup of the Big Dipper. All three bases of the pyramids (triangles) link the cups of the Big and Little Dippers. All three pyramids (triangles) sit on top of the solar boat of Ra. The terms triangles and pyramids have been used interchangeably; however, while they may be similar they are not the same. Therefore, another I'mage (D. Carlton Rossi copyright 2014) is introduced for clarification. It is from the pyramid series and called Die Himmilishcen Fundamente der Pyramiden (D. Carlton Rossi copyright 2014). It shows what might be called an aerial or celestial view of the pyramids with the solar boat on its side. The three pyramids have four sides and square bases. Also, they are notable in that there is an equalization of their size which might indicate pyramids and pharaohs of equal importance in contrast to the nested version. This equalization is also reflected in the interlocking triangular version called El Enclavamiento Pirámides Celestes (D. Carlton Rossi copyright 2014). Equalization promotes harmonization while differentiation supports stratification. It is apparent that both equalization and stratification exist simultaneously in an ideal reality. Its purpose might be to achieve a cosmic balance. In geometric terms one can see how the large triangle associated with Ra or the sun god may be reflected in the triangle belonging to Hathor or the moon goddess which is opposite to it. (see Le Bateau Lunaire d’Het Hert (D. Carlton Rossi copyright 2014) of the pyramid series). Together, the two triangles can be viewed as a square. I'mage of the Ages (D. Carlton Rossi copyright 2014) is a detailed mandala which in part represents the attempt to square the circle. As you can see though it can provide a basic template for the two asterisms. This poem also illustrates how the NCP Rectangle is located at the top of the second square from the centre. It should be noted that The Elegant Celestial Giza series is black on white (with the exception of the vulture) whereas the Banpo series is white on black. The triangle and square patterns are not exclusive to The Elegant Celestial Giza series (D. Carlton Rossi copyright 2014). They are also prevalent in the Banpo Poetry series (D. Carlton Rossi copyright 2014) as mandalas and other poems. This particular pattern combines the frog-fish images. In the celestial versions of both series the frog and fish are sacred animals. 1. The Lost Histories of Alexander the Great, Lionel Pearson, p.145. According to Strabo, Nearchus started on his coastal voyage at the time of the evening rising of the Pleiad in the autumn. Arrian gives the Athenian date (just before the rising) of the twentieth of Boedromion which according to Beloch's calculation would be September 20th or 21st in the year 326 B.C. 2. "Nearchus says that when they were sailing along the coast from Kyiza, just at daylight they saw a stream of water spurting out from the sea as though it were being forced up by squalls of wind; and alarmed at this they asked the guides what this thing was and what caused it; and they replied that there were whales moving along under the surface spouting water. Nearchus says that the oars fell from the hands of the sailors in fright; and he went along the line of ships to rouse their spirits and cheer them, and all the crews that he came to as he sailed along he told them to raise the battle cry in line with their stroke and to row at full speed and splashing furiously. So they plucked up courage and at the signal they moved away all together, and when they came near the monsters they shouted with all the strength of their lungs and the trumpets sounded, and the splash of theirr oars could be heard for a great distance and so it happened that the whales, just as they became visible ahead of the ships took fright and dived down into the depths and afterwards came up to the surface astern and again set up a great spout of water. Then there was a clatter of applause from the sailors at their remarkable escape and praise for the courage and cleverness of Nearchus"
The orca "killer whale" is the largest member of the dolphin family. It has a tall, falcate (sickle-shaped dorsal fin and large paddle-like flippers. 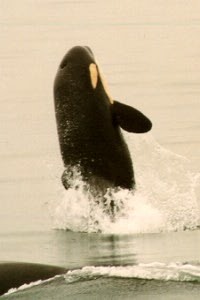 Orcas eat a diverse diet of fish, squid, sharks, marine animals, turtles, octopi and birds. Orcas commonly breach. The Right Whale is a baleen whale that filter feeds plankton and tiny crustaceans like copepods, krill and pteropods from the water. It has no dorsal fin. It is one of the largest animals on the planet. The Right Whale often breaches; for example, Eubalaena Australis breaches commonly. A true breach is when the whale breaks the water. twists in the air and lands on its back. Whales breach about 80% of the time in this way; otherwise, they do what I call a false breach or a belly flop. Delphinus or The Dolphin is modelled on the common Atlantic Bottlenose Dolphin. It is also found in the Mediterranean Sea. The Atlantic Bottlenose is a small cetacean. It is one of 76 cetacean species. It has a long, beaklike snout, a facate (sickle-shaped) dorsal fin, and sharp teeth. It lives in small group called a pod. The dolphin grows to be at most 12 feet (3.7m) long and may weigh as much as 1,400 pounds (635 kg.) It has a streamlined body and a rounded head. It also has slightly pointed flippers. It is a hunter that eats mostly fish and squid. Orcas and sharks are its natural enemy. 6. "Moreover, Nearchus says that when the king was completing his journey he himself began the voyage, in the autumn, at the time of the rising of the Pleid in the west". 8. Homer refers to the star Sirius of Canis Major as the "autumnal star" in The Iliad. And on his shield and helmet stood a fire." [ The first battle continued, wherein Pallas strengthened Diomedes to supply the absence of Achilles. This cluster is known as the Crab Nebula. The supernova remnant is one of the most famous in the night sky. It was discovered by Edmond Halley in 1714. Aquila (the Eagle) is the messenger from heaven, leading souls to immortality. a)ALTAIR: also called Alpha Aquilae, is the most southerly of the three stars of the Summer Triangle. It is also the most similar to our Sun, being only 1.5 times larger, and 10 times more luminous. It's also closer to us than either Vega or Deneb only 17 light years away. Altair is part of the Aquila (Eagle) constellation. b)TARAZED: The name of this star, Tarazed, comes from the Persian name for the constellation of Aquila, Shahin tara zed, "The Star-striking Falcon." A supernova explosion (lasting a couple of months) was observed by Chinese astronomers and is also mentioned in the Korean chronicles. This supernova was presaged by a triple conjunction of Jupiter, Saturn and Mars in February of 6 BC. Interestingly, according to Matthew 2:9, the three Magi (Zoroastrian astronomer-priests) first witnessed the nova event in the eastern sky (over Iran) but then, having completed their long journeyed down to Jerusalem, they saw the Star appearing in the southern sky over Bethlehem at dawn: '… they (the Magi) departed (from Jerusalem) and, lo, the Star which they (first) saw in the east went forth (southward) before them until it came and stood over where the child was'. Kidger has determined that the heliacal rising of the Aquila supernova shifted in the sky from east to south over the seventy or so days it took the Magi to reach Palestine - in accordance with Matthew's gospel. "However, Ho Peng Yoke in his catalogue of "Ancient and Mediaeval Observations of Comets and Novae in Chinese Sources" lists two objects in 5 and 4 B.C. in the Chinese constellations Chhien-Niu and HO-KU, respectively. These small configurations correspond to regions in Capricorn including beta and xi Caprircorni, and in AQUILA including alpha (Altair), gamma, and phi Aquilae". "In the second year of the period of Ch'ien-p'ing, second month, a hui-hsing appeared in Ch'ien-niu for more than 70 days"
Two early Novae were recorded in Aquila. The first one appeared in 389 A.D. was as bright as Venus. The second one shone brighter than Altair (the brightest star of Aquila). Nova Aquila was an aged white dwarf star that exploded in late 1999. It put out more than 100,000 times more energy than our sun. Eight months after the initial explosion the activity was still not over. It had taken 100,000 years to get enough energy to trigger a thermonuclear explosion. Arrian, Anabasis of Alexander and Indica, translator Edward Chinnock, London: George Bell and Sons, 1893. This constellation exhibits 70 stars visible to the naked eye. It includes five Chinese constellations. This constellation exhibits 30 stars visible to the naked eye. It includes two Chinese constellations. This constellation exhibits 140 stars visible to the naked eye. It includes nine Chinese constellations. Generally speaking, all material things change and are in a process of flux. How does one achieve some measure of certainty in uncertain times and places? This paper will look at some methods to achieve a degree of certainty either directly or indirectly through astronomy while concluding with possible consequences of uncertainty. The flooding of the Nile River was important to ancient Egyptian civilization. The silts brought by the river nourished the land. In terms of certainty of time, a method was devised to predict the onset of flooding. It was realized that there was a connection between our sun (a star) and the distant star of Sirius. On a certain date every year our sun eclipsed Sirius. It hid Sirius for 70 days or during the time of flooding. (It no longer predicts flooding because of precession). In China, the flooding of the Yellow River was not so benign. These destructive floods seemed unpredictable and irregular. Therefore, a great degree of uncertainty arose. However, Huangdi devised two ways to establish certainty in other areas. The first method was the invention of the south-pointing chariot. There had been an uncertainty in warfare regarding directions. If the sky was overcast and one’s position could not be set by the sun during the day or by the stars at night then one was at a great disadvantage. Also, if natural phenomenon like fog obscured one’s view then one could not advance against the enemy. A geared mechanism allowed Huangdi to direct his army through heavy fog. It was a scientific invention that allowed Huangdi to defeat his enemy. The direction of the pointer could also be verified in clear skies with positions of the sun and stars. The second invention of Huangdi which led to certainty was the calendar based on the solar year. The lunar calendar varied too much and its accuracy was deficient. If one wished to understand the heavens and one’s relation to the stars then a lunar-solar calendar was needed. Civilization, too, was advancing from a nomadic to a sedentary society based on agriculture and aquaculture. Farmers had a better idea when to plant and harvest crops in the fields and rice in the fish ponds, based on the new calendar. Confucius established certainty with his reference to the Pole Star which shows the north direction. He said that the Pole Star is regarded as the one around which all others pivot. Over the millennia, the position of the pole star varies. In 2700 BCE, it was Thuban of Draco, in Confucius’ time it was Polaris while in the year 13,727 BCE it will be Vega. It will return to these stars, too. Whatever the name of the pole star, it will serve to guide in uncertain circumstances and provide certainty for many in many ways. The character “ru” is said to have come from the character “xu” which was composed of two parts or cloud and sky. The meaning of the character ru has also changed over the centuries, as has the position of the pole star; but, the importance of both has not changed. The shamans of the Shang Dynasty studied rituals, but they also needed to familiarize themselves with astronomy/astrology to predict rain or drought. Ritual dances were performed in rain-making. This is reflected in the poem called 無 where there was a ritual dance of a shaman to bring rain. Later, ru applied to professionals in rites, rituals and ceremonies. By the time of Confucius, ru referred to ritual masters who became teachers in official education. They mastered six areas of skills. One of the skills was astrology/astronomy. For example, Confucius recorded thirty-seven eclipses of the sun between 720 and 481 BCE. Yao, Xinzhang, An introduction to Confucianism, Yao, Xinzhang, Cambridge University Press, Cambridge:2000, pp.19-20. It seems that there are at least three ways to establish certainty. They are related either directly or indirectly to the stars. The first way is the invention of a calendar. It may be a solar calendar, used by the Egyptians, based on the heliacal rising of Sirius along with the flooding of the Nile or the Chinese calendar based on longitude of sun and lunar phases. The second way is through a design or physical invention that shows direction such as the south-pointing chariot in China. The third way is the study of astrology/astronomy. It was said, for example, in Egypt that the Nile mirrored the Milky Way while in China the Yellow River mirrored the river of stars. In particular, though, it was the recognition by many civilizations that stars pivoted around the Pole Star and the Big Bear pointed to it. The poet wished to honor Confucius. He decided to design a full constellation or asterism called 孔 至聖 星座 (© D. Carlton Rossi). It would combine seven stars from two different constellations and also add our sun. The number of stars would coincide with the number of stars in Ursa Major plus the Pole Star in Ursa Minor. While the poet’s “Golden Sol” deals directly with the new constellation; nevertheless, its precedent was a reference to the Big Dipper and Polaris in an earlier poem called “The Question Mark”. Notice that in the second line there are eight words of two letters each. As the question mark mimitates the pattern of Dipper and Polaris, so, too, does the new constellation imitate it. The new constellation would include opposite kinds of whales in a harmonic dance. The idea of “harmony” is a key concept of Confucianism. It is no accident that the painting depicting the ritual dance of the male and female whale is called harmony. Our sun would hold a special place in the constellation at the tip of the arc of the dorsal fin of the Orca whale. Of course, we are able to establish direction with our sun because to us it rises in the east and sets in the west. This new constellation could be seen under special circumstances from the earth during a predicted eclipse of the sun or could be viewed from a hypothetical planet revolving around Sirius B. One of the stars of KGSC (© D. Carlton Rossi) or Altair is important for directions as a first magnitude star and as part of the Summer Triangle. It lies virtually overhead during the summer months in mid-northern latitudes. In a more general way, today, the issue of certainty is also reflected in the stars and planets. What is the purpose for any nation(s) to visit the red planet if we cannot breathe on planet Earth because of uncontrolled automobile, industrial and power pollution? Every breath we take becomes a struggle. Our enemy is the by-product of an industrialized civilization. It enwraps everything. It insinuates itself into every crack and crevice. Human beings face great uncertainty,—for example,—with every breath they take. It may not bother many if they can neither see the planet Mars nor know its direction by sight. However, if one cannot see what one has built or created on the planet Earth or see nature’s creation then what is the purpose? If one cannot see one’s own children and grandchildren because of smog then what is the meaning? If one celebrates one’s accomplishments through a display of fireworks, but cannot afterwards see them because of smoke clouds of burnt powder, then wherein lays the victory? One is lost when one cannot see one’s goal and in what direction one is going to meet it. It may be that we have reached the tipping point in terms of extinction of the human race. In that case, perhaps only a selected few will survive on a distant planet. The selected few will be able to see the stars and our sun. The few will be able to see our Earth which we could not see ourselves.